Most of the beer posing as made by small breweries is actually just controlled by the same companies that make all the other beer. The Craft Check app will make sure you’re only drinking truly independent suds. Beers like Blue Moon, Shock Top, and Goose Island may sound–and even taste–like “craft” beers. But technically, they’re not. 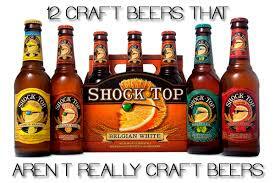 Shock Top and Goose Island are controlled by Anheuser-Busch Inbev, one of four global mega-brewers. And, Blue Moon is part of Tenth and Blake, owned by SABMiller/MillerCoors. They have craft characteristics, you might say. Yet they don’t fit the official definition set by the Brewers Association, which decides what is and isn’t craft. To qualify officially, the brewer must be “small” (producing no more than 6 million barrels a year), “independent” (no more than 25% ownership by a non-craft brewer), and “traditional” (no “flavored malt beverages”).